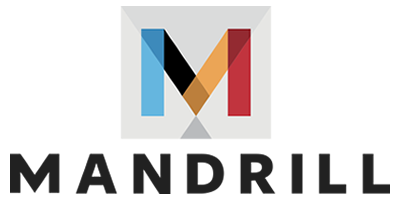 When Mandrill sends an email, the recipient's mail server provides a response when the message is accepted for delivery, when it bounces, or when it can't be delivered for any reason. Mandrill stores these SMTP responses for you automatically. If an email is accepted for delivery by a recipient mail server, Mandrill does not have any additional insight into what happens to the message from that point. For example, the message may go through a series of spam filters or other processes that aren't disclosed to senders. You can also enable open and click tracking for additional confirmation on the status of an email delivered by Mandrill. Filter your activity by Delivered emails, Hard Bounces, Soft-Bounces, or search for a recipient email address manually. Click the message status link to view the full SMTP response. We'll also show you the originating IP address, the IP address for the mail host that accepted the email, as well as the size of the sent message. 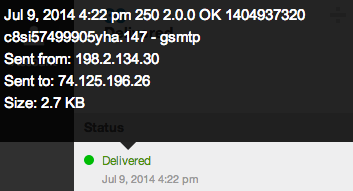 You can also view the response(s) via our API and webhooks in the smtp_events array. 2: A response that begins with a '2' generally means that the message was accepted without error. 4: Responses that start with '4' typically indicate a temporary error. We'll usually retry delivery on these. 5: Responses with a '5' at the beginning of the code usually indicate a soft bounce or a hard bounce. The second and third digits can provide additional info, but are usually highly-contextual and specific to the particular mail server. Rejected emails won't include SMTP events as these messages aren't sent.